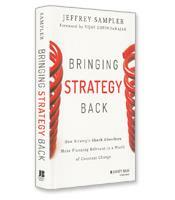 Strategy expert Jeffrey Sampler introduces four "strategic shock absorbers" that enable leaders to build resilient organizations that can withstand even the most unexpected global turbulence. With this framework, leaders will be shown how to be prepared and proactive, rather than reactive, even when the future is uncertain. Why strategy is more important than ever for your business. Groundbreaking strategies from businesses in India and Dubai. The four Strategic Shock Absorbers and techniques for how to use them.